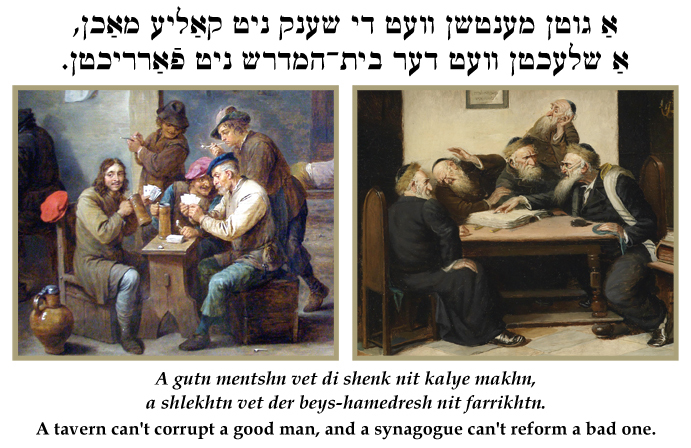 Yiddish Wit: A tavern can't corrupt a good man, and a synagogue can't reform a bad one. ‏‏אַ גוטן מענטשן וועט די שענק ניט קאַליע מאַכן, אַ שלעכטן וועט דער בית–המדרש ניט פֿאַרריכטן. A gutn mentshn vet di shenk nit kalye makhn, a shlekhtn vet der beys-hamedresh nit farrikhtn. A tavern can't corrupt a good man, and a synagogue can't reform a bad one. SOURCE: Stutchkoff, Der Oytser fun der Yidisher Shprakh. IMAGES: detail from Tavern Scene by David Teniers the Younger; detail from Eine Streitfrage aus dem Talmud (A Talmud dispute) by Carl Schleicher.